Alstom-Grid (Reason), Flexibilis, Kyland, Mainberg, Oregano, SoC-e and Tekron took part in the PRP-HSR IEC 61850-9-3 PTP Profile Tests that were celebrated at the ISPCS 2015 Plugfest (Beijin, October 12th). 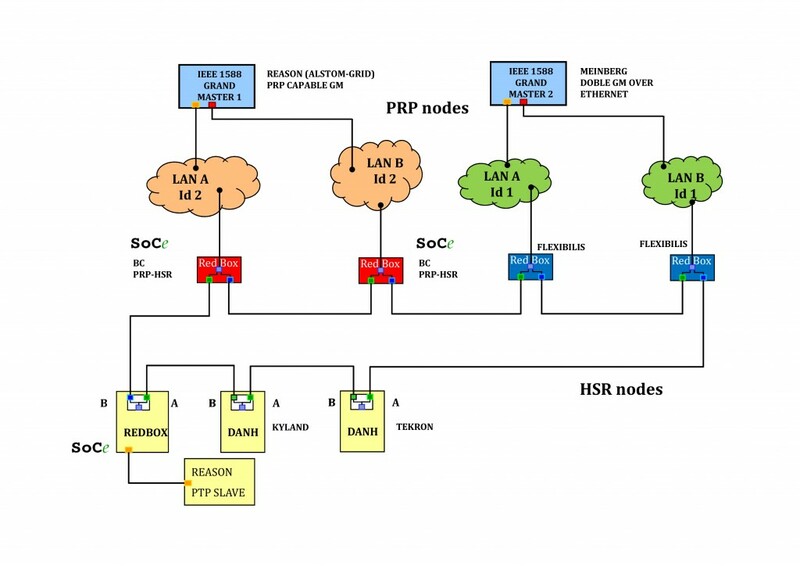 SoC-e technology was used to link PRP and HSR networks using its Boundary Clock PRP-HSR Redbox functionally. The test covered Layer 2 and Layer 3 connectivity and the analysis of the accuracy and stability under different conditions (links removals, traffic load, etc.) was performed with excellent results. The following diagram depicts one of the test run.